So the weather outside is frightful…. But the fire is so delightful…. Actually there’s no fire but the weather is truly horrendous and I’m sitting here like one of the three little pigs with the wind and the rain doing their best to blow the house down. Hopefully, since we’ve been sensible and built our house out of bricks, we’ll see this stormy weather out. But in the meantime there’s not a whole lot to write about in the garden. Apart that is from…. 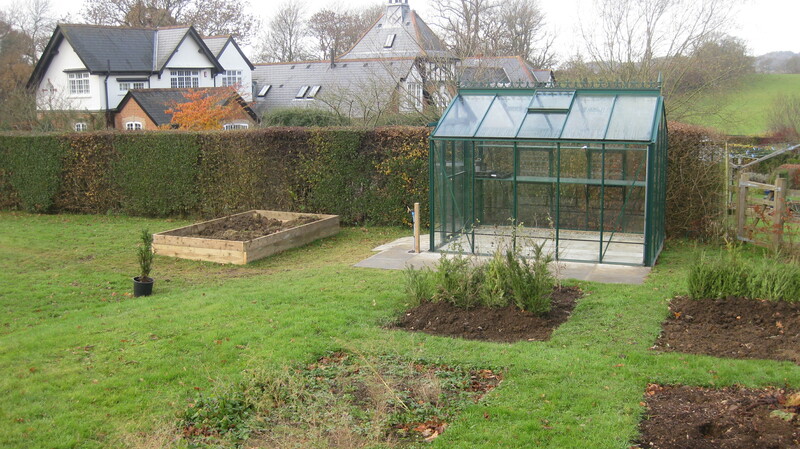 Is it sad to be so excited about a greenhouse? Yes it probably is…. But I don’t care. This is something I’ve been planning for years. And it’s finally happened. So let me talk you through it…. If you’ve read the page about my garden you’ll know that when we moved into this house the garden was a little lacking in…. well it was a little lacking in anything really. Apart from grass and fence, that is. 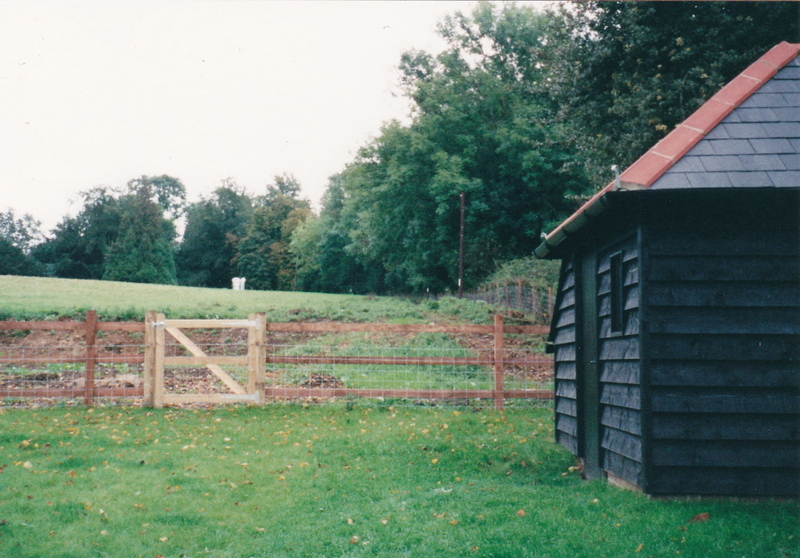 The house nestles at the bottom of a north facing slope, most of which is our field and a section of which was the garden. 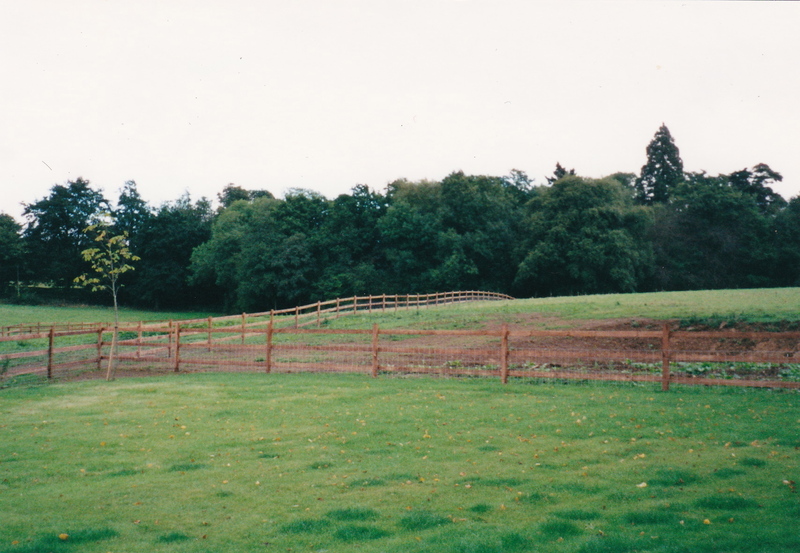 While the developers had their contractors in shifting earth around for the other properties next door we asked them to level out a section of field on the far side of the fence to give us a flat area to use for…. We’re talking about the area on the far side of the fence…. Well we weren’t exactly sure what we wanted to use it for but it seemed like a good idea at the time. Over the years we’ve kept chickens there, put a trampoline up there and then got rid of it when the children grew out of it, (actually before they grew out of it but it had to go because it was so ugly), and we had a marquee for a mega party to celebrate my 50th, my son James’s 21st and Hattie and Emma’s 18th birthdays, which all occurred in the same year (James and my big birthdays on the same day) which was about as good a reason to have a mega party as I can think of…. So a couple of years ago when the veg habit beckoned I (or rather Stuart) dug out some beds and planted some fruit trees as the start of my vegetable garden. Then everything got left for a couple of years while life got in the way. But now that I’m back and better than ever the grand plans are swinging into action. Don’t you just love it…. It went up in the mud and the rain a month ago and at the moment it’s looking a bit stark. But just you wait. I’m showing you the pictures now so that you’ll appreciate that we have a way to go before this part of the garden achieves the effect I’m looking for. 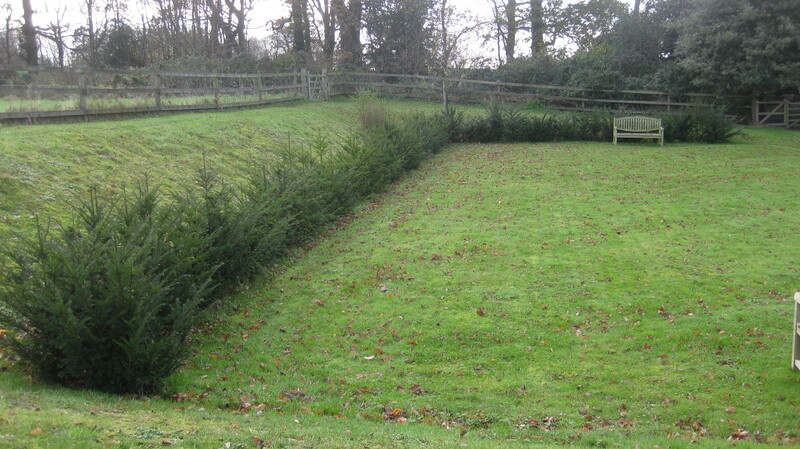 Then there’s the section of mixed hedge to go on the far side of the new raised bed and the replacement for the section of yew hedge that I lost – the away team supporters. At the moment they’re heeled in, waiting for the trench to be dug so we can plant them. 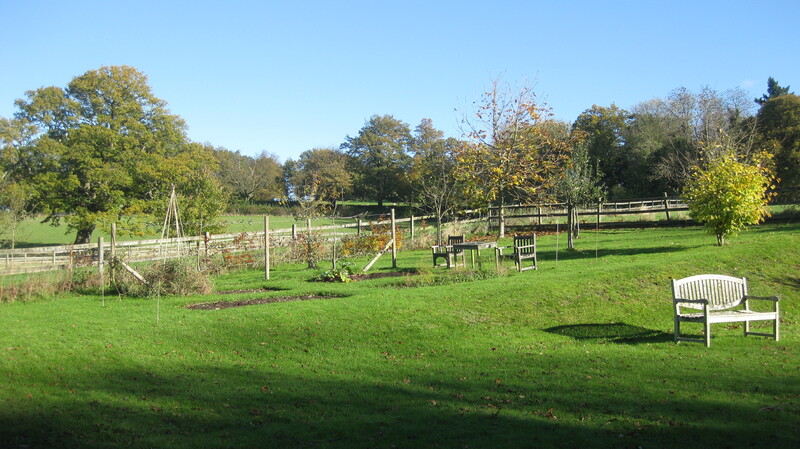 The intention is that the veg garden will be surrounded by hedge so that it is separate from the rest of the garden and has an identity of it’s own. Another room so to speak. One day it will be beautiful…. We’re going to expand the existing beds and edge them with wooden planks, turning them into two large beds rather than four small, and adding another for the perennial veg like asparagus and rhubarb. I’m thinking of planting a group of silver birch on the near side of the new section of mixed hedge to block off the roof of the greenhouse which will still be visible even when the hedge has established. 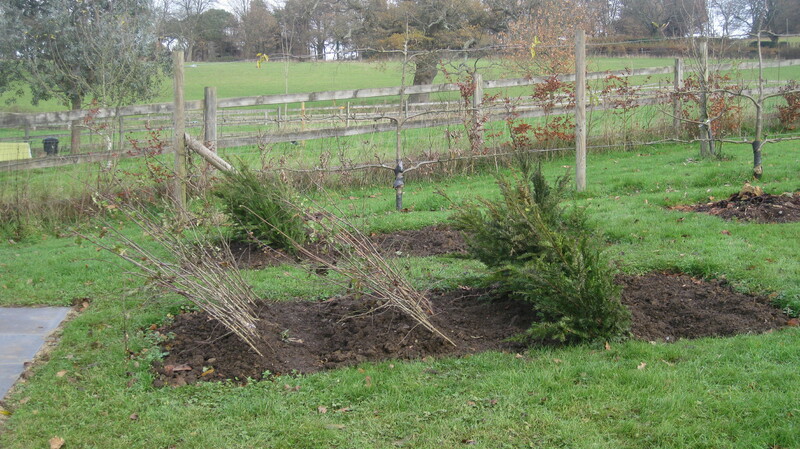 And I’ve got a mad idea about planting hornbeam and topiarising them into cones in a row along the hedge leading down to the veg garden. Although this may be a step too far. 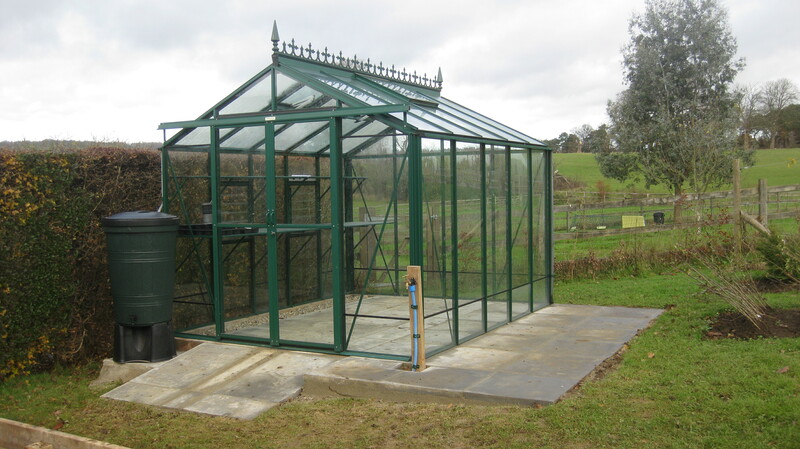 And then of course there’s the greenhouse itself and what to do with it inside and out. So much to think about…. If you’re interested I’ll keep you posted….